I'm sipping my morning coffee and have a few thoughts I wanted to share. Let me try to flesh them out on here before I head back into lab for Day 10. I don't think British people realized exactly what they were voting for with the "Leave" vote. 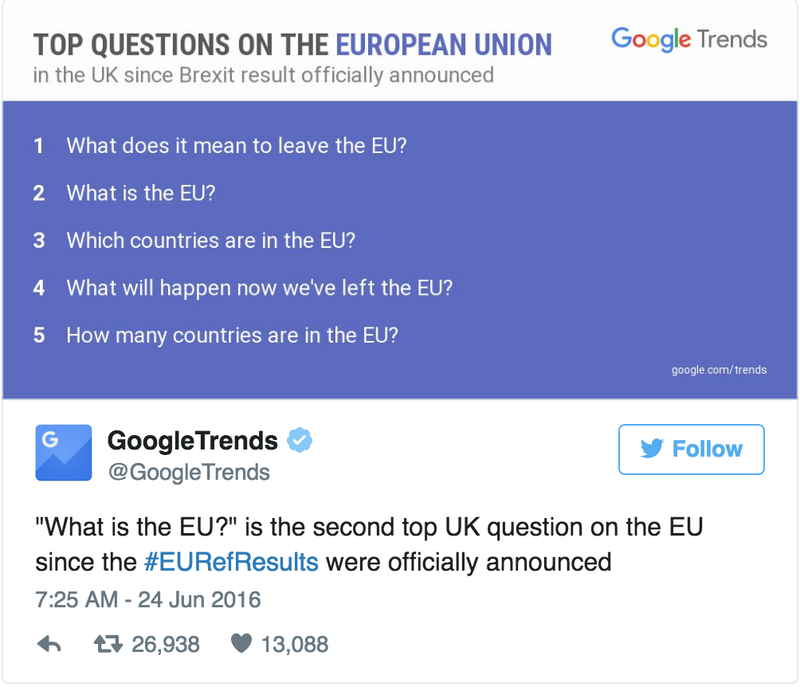 The numerous reports of Google search upticks stemming from within the UK with basic questions such as, "What is the EU?" "What happens if we leave?" Yeah...probably should have researched this sooner. Or, you know, heeded the advice from experts. They are experts for a reason. Among one of the consequences...British businesses will suffer. Because, being part of the same entity = free trading/no taxing on goods. This is why you are able to find awesome real leather sandals at Monoprix made in Italy, or thriving Spanish-label ZARA boutiques with beautiful items made from all over the EU, or Irish massive store Primark carrying gorgeous maxi dresses from Romania--all at a fraction of what it would cost to buy those items in the States (real leather sandals for $40 in the States? More like $200). If Britain is no longer part of the EU, their businesses will suffer because they will now pay taxes on imports and exports of goods and services. How can they compete with all of the European businesses who aren't subjected to the same taxes? That's the beauty of the EU. EASY JET. CHEAP FLIGHTS ACROSS EUROPE THAT WE JETSETTERS KNOW & LOOOOVE EUROPE FOR! My sisters and I via the iconic, orange EasyJet several years ago. We, among many others, love the economical airlines that allow you to hop from EU country to EU country! 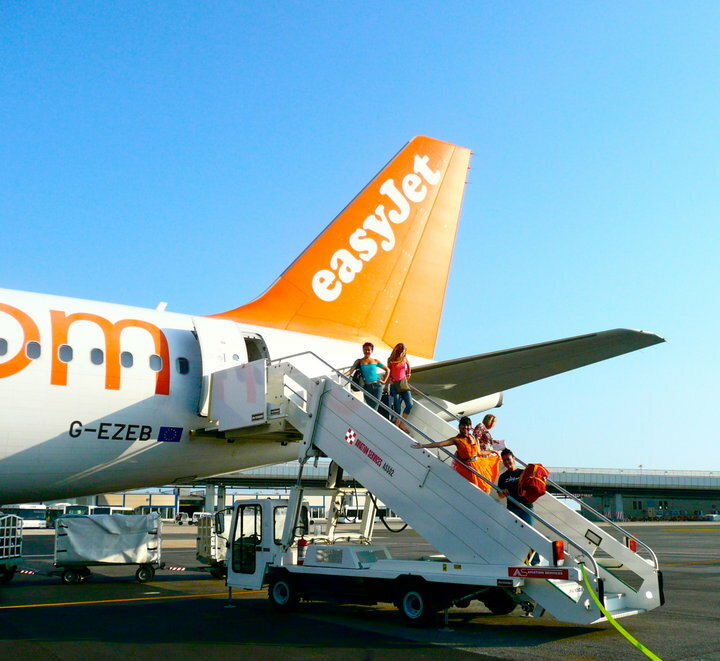 What will happen to EasyJet now that Britain will technically operate outside of the EU? Traveling within the EU is so easy, thanks largely to not needing to exchange currency (I still miss the franc, though) and being able to pick a last-minute flight to anywhere within those 28 countries (well...that number has changed now, I suppose) for CRAZY LOW price. It costs me $350 to fly roundtrip with 1 stop from Philadelphia back home to Orange County, California--and that's the cheapest ticket I was able to book, too. If I want to leave the airport at a decent hour (read: not call an Uber at 3 AM to go to the airport) and not take a red eye, it would be a $500 ticket, minimum. 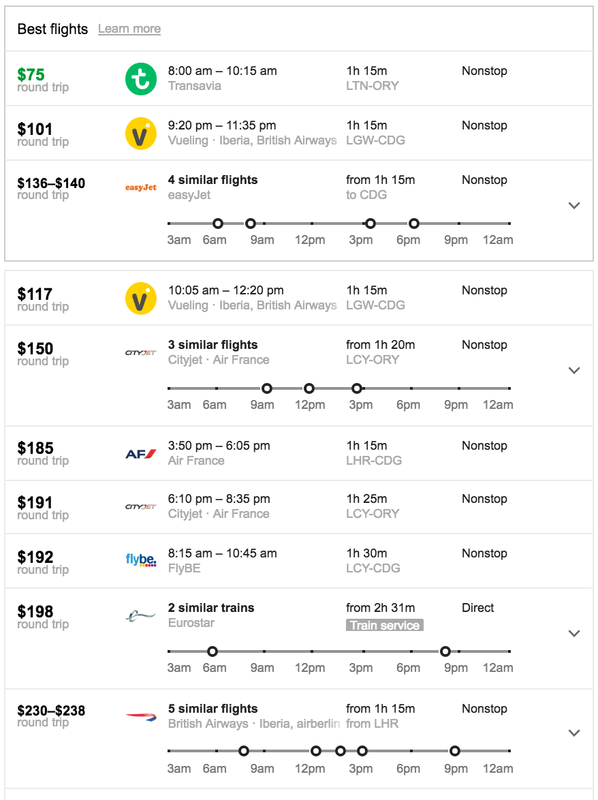 In Europe, I can jet from London to Paris for $75 roundtrip nonstop on Dutch airlines Transavia. Note, you'd be landing in Orly and not CDG, but it's not that big of a difference as long as you made it in Paris! Hmm British company for $136 or $230, or Dutch company for $75? 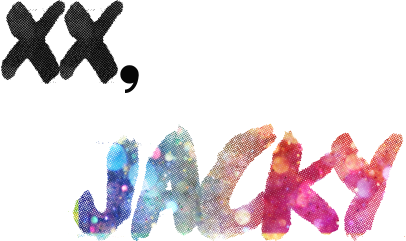 And if you feel swanky? Air France is only $185. But what about British Airways? Note that these prices are also just what is current, so how much they will change later on as the British economy *really* feels the burden is yet to be seen. Now, this was the next cheapest route I found, so who knows how these prices will be impacted with more time? 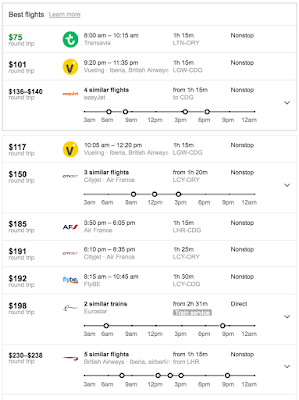 Even the Eurostar (train) comes in at $198, so it's safe to say most people would go with one of the many alternatives before going with British Airways. Obviously, Britain still kept their own currency, anyway, but they were also operating within the EU. Now, what will happen to the operational costs of their airlines when they will be considered operating outside of the EU? Now, EasyJet is a British company, but I'm not sure if it will be able to continue operating at such low costs to compete with the many other European airlines (there's also Ryanair and many other alternative airlines) who all benefit from the same playing field in the EU. It would take a lot of negotiating on behalf of the British government and businesses, meaning they would have to cast their pride aside and be at the mercy of the EU, which seems quite the opposite of the energy in which votes were casted. So, when the British companies need to begin paying duties and taxes on their services and goods, you can be sure the increase in cost will translate. Perhaps Britons thought about this very unidirectionally, but the cost translates to small businesses as well--beauty salons who get their products from the EU market? They're going to have to pay import fees on those goods now, and both business owners, employees, and customers will feel the negative effects. As a bit of an aside (but still related), I'm glad Primark is Irish (as it just came to the States last year--the King of Prussia, Pennsylvania location opened up in November 2015!). I'm expecting prices to rise in products from Asos, Boohoo, Topshop, Missguided, Selfridge, River Island, etc...and especially with British designers! Some people are worried about Brexit setting a precedent and other countries following, but that's doubtful because there are more upsides to being part of the EU than downsides of being outcasted in the local region. What Brexit does set up, however, is conversation about citizens feeling desperate for changes to the EU and for the EU to be more transparent to the citizens of its member countries. Citizens were so desperate in circumstances that they lost sight of the bigger picture. What else will Britain suffer for? Besides businesses now having to do some heavy negotiating to compete price-wise with fellow European countries, academia is also going to pay the price. As it was, the Universities had top academics from all the different European countries. This is wonderful for science and academia, in general. We want more skilled thinkers and workers and students and professors--pooling together the best of the best from all over is much more beneficial for advancing technology and learning than sampling from one population in isolation. By Britain leaving the EU, the UK will lose funding for EU research. One of the strong suits of academia and research in Europe is that the research and funding is set up to be performed internationally, which is ideal. People who planned to move to the UK will probably retract their decision because it's chaos right now. With panic and instability comes desperation, rash decisions, and unpredictability--situations of which you do not want to be in the middle unless you can afford to lose time, money, and energy. It will now be harder for British people to freely travel across the EU like they were able to enjoy before. Ditto goes for moving, buying property, and settling down/retiring in other EU countries. There's even talk about it being harder to get healthcare access for those who moved out of their island and settled down in another EU country, but that seems unlikely. Other EU countries are unlikely to punish expats with restricted access to healthcare, as the move invites retaliation. EU countries are also generally understood to be humanitarian in their modern efforts. That is also why the EU was formed in the first place. And the value of the previously-strong British pound? Depreciated overnight. Of course, I believe this will bounce back within a year or two, but overall, the 401ks/pensions, property values, and investments that British people have made will be worse off. Britain will be poorer. Some people can afford to wait 10 years for values to rise again, but others need their retirement now. 4.5 million Britons live abroad, with 1.3 million elsewhere in Europe. 319,000 British expats are in EU country Spain, alone. I also know that real estate is a lucrative business for many Brits in France; how this may affect their taxation, I am uncertain. However, even though Britons abroad may not have restricted access to healthcare in the different EU countries or be deported back to the UK, their quality of life and being able to afford living abroad will be impacted significantly as they rely on the value of the British pound. On the bright side for Britons, if people moved out of the UK to live elsewhere in the EU because it was too expensive to live in the UK, now that property values have dropped, they can return home again. Maybe that's the good thing the youth have to look forward to? Since the votes were casted thinking about a better future for the British youth and all (read: no immigrants). I hope my friends living abroad in the UK, and my UK friends who are expats, are okay. I feel for the Londoners who voted to stay, but London is an international city with its own booming economy, and I have hope for them that they will come out on top. I find it quite interesting that London's former mayor (Boris Johnson) seems to spearhead the UK leaving, while London's current citizens voted to stay. Please diligently do your research before voting on important measures, such as deciding whether to cast aside the EU or not. Or, in the United States' situation, throwing away the relationship with China. We *do* owe China a *lot* of money. 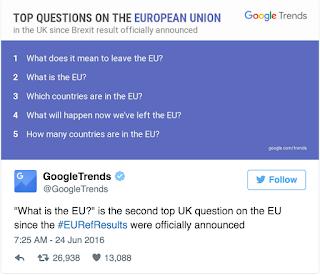 There have been many articles outlining what voting to leave the EU means since 2013, and possibly before. This doesn't just apply to Brexit, but to everything--the information is out there! We just have to be hungry enough for it! I don't know if a re-vote at the moment is possible, but I would imagine the party that "won" wouldn't allow a re-vote to happen, even if the citizens now hope for one (now that they feel the backlashed effects of their vote). It's a hard lesson to learn, but there is a sort of karmic punishment for being racist. This may not have been the blatant intention of some people who voted to leave the EU, but the genuine (and naive) conviction that the country would be far better off without immigrants will have the consequences rightfully felt. Careful what you wish for, they say. It's also a good lesson for us Americans to preview before we head to the polls ourselves. People are people, and people need constant reminders on things we should know to do--such as learning what the real consequences of our decisions could be before we sign on the dotted line. What else am I thinking of, in terms of Britain losing strength? The British passport used to be deemed one of the "most powerful" passports. Now that the UK voted to leave the EU, it's logical to wonder what might now happen to the mighty passport. The British passport is now weaker. You would still be able to visit other countries, but would it still carry the same weight as the other EU passports? If the UK is no longer part of the EU, then doesn't that mean the passport also loses the EU membership benefit of "free movement" across the EU? The voters must not have thought this through. Voting to leave the EU means losing that glorious blue area. What now happens to all of the money Britain owes to the other European countries? Note: This particular link is from 2011, but it's to give you an idea. Will the interest rates suddenly change? Are they to pay it back more suddenly as a non-EU member now (doubtful, but still a possibility there may be a newfound pressure)? As a result of this decision, if the British economy continues to suffer tremendously, will they need a bailout (like Greece, Spain, Portugal) from the other EU countries in the near future (thus, increasing the British debt)? The British currency has already depreciated, so what does the British debt now mean when adjusted accordingly? What else am I thinking of, in terms of workforce abroad? I remember when I attempted a very naive move (in my early 20s) to Paris, and at the time, the EU economy started suffering as well (US was felt 1st, EU followed). Being American was not a huge advantage as many Brits speak English and French as well, and essentially, their passports were given preference to American passports. So, if they have Britons who speak English, then why would they need Americans? How might the tides turn, now that Britons defiantly voted to shove the EU away for reasons of bitterness in believing they would be stronger and better off without the EU--a move that could be interpreted as disrespectful and unappreciative to fellow trading/academic/economic/healthcare/research/travel/workforce partners? When one door closes, several more may open. One of those doors may be for us fellow Americans. One of my ways of mourning the Brexit decision. Art therapy via calligraphy pen + watercolor. I'm feeling the bruise of Britain right now. Sad time for Europe, but like with anything, time tells. 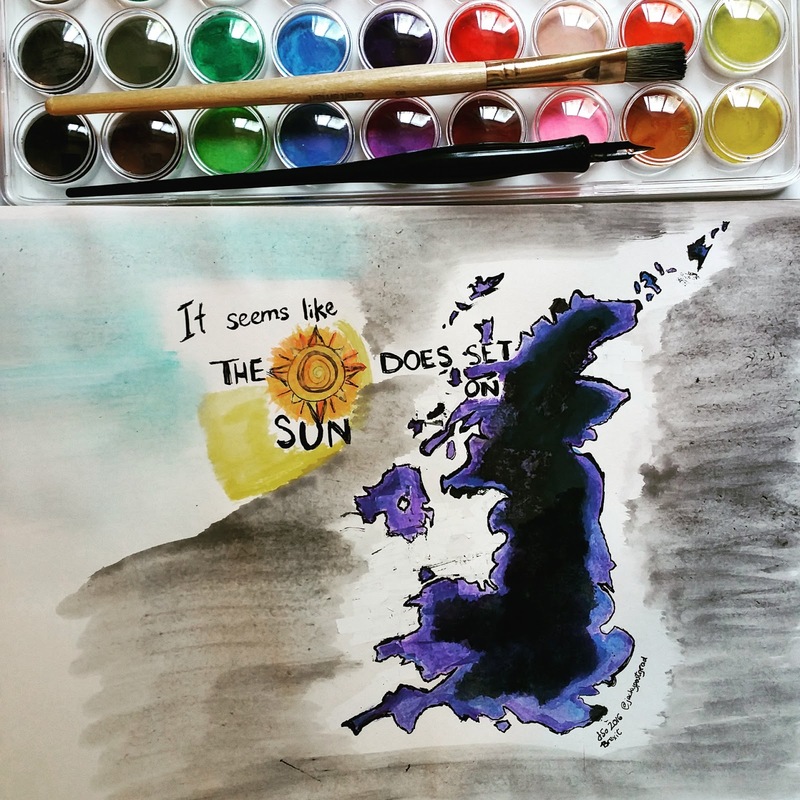 It seems like the sun can set on the British Empire, after all. Here's hoping to a brighter future. My thoughts are with those who will become massively even more affected by the Brexit leave decision. It seems the "older" Brits voted to leave with the unilateral thought of making the country "better" (again, read: no immigrants) for the youth, while the actual youth voted to stay. With these thoughts out of the way...I'm about to head into lab now.